The Los Angeles Angels finalised Mike Trout's record-breaking 12-year contract extension. 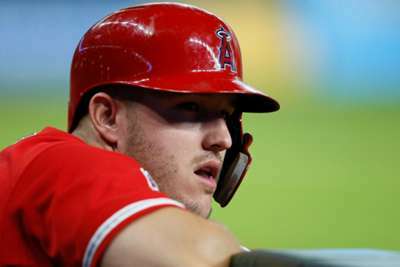 On Wednesday, the Angels confirmed the new deal for two-time MLB MVP Trout, which is reportedly worth $426.5million. Trout was set to become a free agent following the 2020 season – the end of his six-year, $144.5m contract that he signed in 2014. The seven-time All-Star's new deal is a 10-year add-on to his existing contract – making him the highest-paid player in MLB, surpassing the total value of Bryce Harper's 13-year, $330m deal with the Philadelphia Phillies. It is also the highest in average annual value, surpassing Zack Greinke's $34.4m as the MVP would make on average $36m. The deal has a full no-trade clause with no opt-outs, according to reports. "This is where I wanted to be all along," Trout said in a statement released by the Angels. "I have enjoyed my time as an Angel and look forward to representing the organisation, my team-mates and our fans for years to come." The 27-year-old centerfielder was originally taken with the 25th overall pick in the 2009 draft by the Angels. Trout has slashed .307/.416/.573 in eight seasons with the club while hitting 240 home runs, stealing 189 bases and driving in 648 runs. Rumours had been swirling about the possibility of Harper trying to recruit Trout to come play with him and the Phillies. Trout – a native of Vineland, New Jersey – grew up a diehard Phillies fan and some thought he would join Harper in Philadelphia. "This is an exciting day for Angels fans and every player who has ever worn an Angels uniform," Angels owner Arte Moreno said. "Mike Trout, an athlete whose accomplishments have placed him among the greatest baseball players in the history of the game, has agreed to wear an Angels uniform for his entire career."